Relate: The Swiss smothered him. For the entire first half, the Swiss team seemed to be the better squad as they outplayed the team that was considered to have the best chance of winning the World Cup. Argentina could do nothing and that is because the Swiss defense had smothered Messi, the greatest player in the world. (It burns me to say that since I am a Real Madrid fan but my Ronaldo runs a distant second). Anyways, they had him stopped dead to rights, but the Swiss offense didn’t capitalize on the opportunities they had. Over and over they missed the opportunity to get the lead. Throughout the entire ninety minutes of regulation and nearly the entire overtime period, the Swiss defense had smothered Messi while their offense just could not capitalize. Then it happened. With about two minutes left to play, Messi got the ball around midfield. He burns Nico Dunner, outpaces two other defenders and then catches a third out of position with a beautiful cross to Angel Di Maria. Di Maria shoots it beyond the diving reach of the goalie and just like that, as most of the world watches on, Argentina is going on and Switzerland is going home. They had stifled him for nearly two hours but in one unguarded moment Messi demonstrated why he is the best player in the world. Until that final whistle blows, until that final horn sounds, you cannot let up. React: As usual I was disappointed with USA’s performance this year in the World Cup. We have come to the point where we have enough talent to be considered a legitimate contender… just not a top contender. We are no Brazil or Argentina, Germany or Spain, but we do belong in or near the top ten. 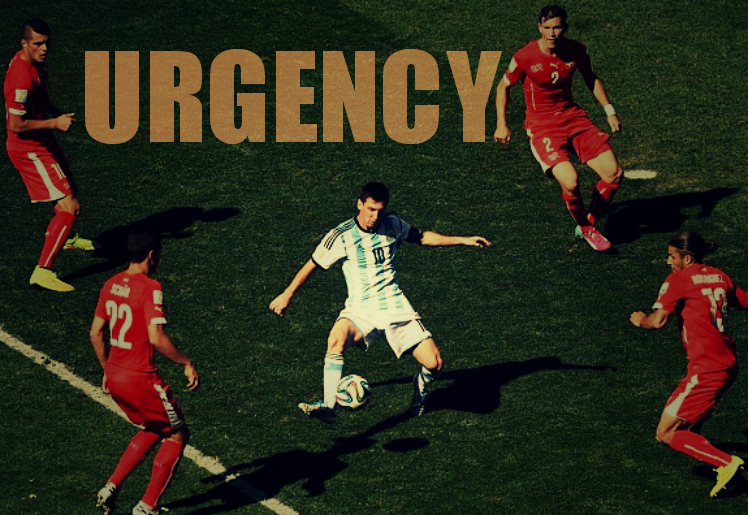 The thing is, we have no urgency. The closer it gets toward the end of the game, the more the Americans seem to coast while their competition doubles their efforts. I couldn’t tell you the number of times I’ve seen us blow a lead, or lose a tie, in the last few minutes of the game. As a Christian, I know that final horn is one day going to sound. The more time goes by, the closer that moment gets when Jesus returns and it will be game over. Am I living with a sense of urgency this moment in time so desperately needs or am I just coasting through until that final moment? Am I guarding against the enemy of my soul, or am I allowing him to make another of his attacks on my heart? Do I have any idea how close Jesus’ return truly is? We need to live with a desperate sense of urgency but it seems like more and more of us are simply coasting into the finish line. God, help me to live with a sense of urgency. Help me to realize how close we are to the end. Help me to capitalize on the opportunities You have presented me. Help me to not always assume there will be another. Help me to not just shrug it off saying I will get another chance. Your return is very near. Help me to live in the knowledge of this truth. Yes we must be about our fathers business, good post enjoyed reading this. Great analogy. I think it goes for living with urgency – enduring in righteousness – to the end of our own lives, whether that’s because of the Second Coming or our own death.